Monica Piper in her one-woman show ‘Not that Jewish.’ Photo by Carol Rosegg. Despite its title, Not That Jewish is actually a 90-minute exploration of what it means to be Jewish. The show, which played for 16 months in Los Angeles, runs through January 2017 at New World Stages in Manhattan and will travel to other cities after its New York run. Piper, a Santa Monica resident who gives her age as “somewhere between Clearasil and Porcelana,” and whose previous credits include writing for television shows Roseanne and Mad About You, says that homing in on herself was “thrilling and freeing.” The process took her beyond the boundaries of writing in other characters’ voices and helped resolve many of her conflicts about being a “‘Jew–ish’ sort of woman.” In order to tell the story honestly, she reveals the complex track of her life: two failed marriages, her mother’s Alzheimer’s disease, her father’s death, her own breast cancer, one husband’s cocaine addiction and the ramifications of becoming a mother after adopting a son. The result is alternately hilarious and wrenching—sometimes both simultaneously. Not That Jewish was commissioned by the Jewish Women’s Theatre, founded in Santa Monica in 2008. Ronda Spinak, the group’s co-founder and artistic director, met Piper through a mutual friend and approached her to perform a short piece. “I immediately thought of women in babushkas dancing the hora in the shtetl,” Piper says. But Spinak’s goal was exactly the opposite: A writer herself, Spinak, 58, opened Jewish Women’s Theatre to create a place for Jewish women to send their contemporary stories. She began curating and developing short, original, cutting-edge shows—each bound by a theme—that are performed by professional actors in home settings. “We didn’t have a space at the beginning and this was a way to revive a tradition that started in the Age of Enlightenment, when Jewish women were hosting literary, art and music salons,” says Spinak. The shows usually conclude their runs at The Braid, a performance space in Santa Monica. Spinak commissioned several pieces. A Shayna Meydele, the story of Piper’s grandmother—the first to call Piper “a pretty girl”—fit into the theme, “Jewish beauty is…” To Piper, beauty was in the sound of the “odd, funny, rhythmic” Yiddish words that rolled off her grandmother’s tongue and the tolerance her grandmother modeled as she stood up for a gay couple in a bakery. For a show on gratitude, Piper wrote Shamatitude, a loving tribute to her very funny father, Roy Davis, who put a “sh” in front of many words to make them less serious. Her mother, Fritzie Granowitz, was also a joke teller, she says, but in a more clever and dry way. Alzheimer’s prevented her from sharing her daughter’s triumph in landing a Showtime special, No, Monica…Just You, in 1990. Though each story brought Piper closer to her Jewish roots, when Spinak suggested a full-length show woven from the stories—a first for her theater group—Piper responded again: “But Ronda, I’m not that Jewish!”—and that became the title of the play. Piper, now one of Jewish Women Theatre’s artists-in-residence, was nominated this year for the Los Angeles Drama Critics Circle Award for best solo performance. 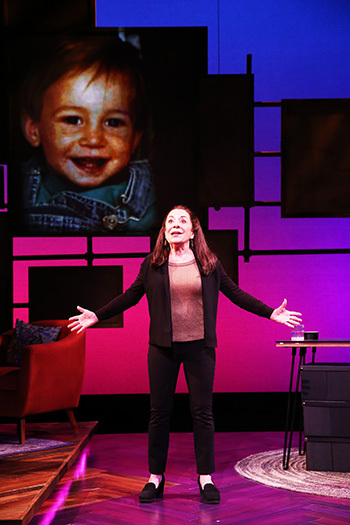 “Monica has a keen ability to impart truth about family and life in a way that exposes the highest amount of humor,” says Michael Alden, the show’s lead producer, “and the deepest amount of emotion.” Alden, who produced the Pulitzer Prize-winning Disgraced as well as Grey Gardens, which received 10 Tony nominations, brought Not That Jewish to New York. After she adopted Jake, now 24, she found it difficult to juggle motherhood and the long hours that accompany sitcom writing and became head writer for the animated series Rugrats. She won the Daytime Emmy for Outstanding Children’s Animated Program in 2003. As Jake grew, she felt it was important to raise him as a Jew and enrolled him in Hebrew school. By the end of the play, Jake gives her some startling news that turns her world upside down—and she is forced to decide what being Jewish really means. Not That Jewish exemplifies the nonjudgmental and diverse perspective Spinak’s theater group espouses. “Jews within Judaism are so divided,” she says. “The only way Judaism will survive is if we look to what unifies rather than divides us.” Spinak belongs to a Reconstructionist synagogue but considers her identity a “mixture of everything.” She was raised in a Reform home in Huntington Beach, Calif., where other Jewish families were rare. Attending a Jewish sleepaway camp solidified her Jewish identity: “It made me feel that I wasn’t alone,” she says. Still, she struggled with what she saw as Judaism’s patriarchal bent. Spinak’s desire to give Jewish women a voice has culminated in 30 hour-long shows, each made up of about a dozen short pieces, that she has commissioned or adapted for the stage. The themes have ranged from stories of Persian women and Jews of color to tales of millennials and Russian immigrants. Today, the focus has expanded to include men. Themes for 2017 feature the power of food, the Sephardic legacy and inspirational acts of courage. Great story! Would love to see you onstage in person! So many of us can relate to being “not that Jewish”…. but having a Jewish heart and mind. PLEASE come to South Florida! There are tons of venues here and a demographic that would love you! We live in Boynton Beach — near Boca Raton. MOST OF US ARE ORIGINALLY FROM NEW YORK.